Dan Sturlaugson is a 3rd generation entrepreneur born and raised in Langdon, ND. Growing up in a small town Dan enjoyed the freedom to spend time with friends, including playing football, baseball, basketball, and riding dirt bikes. At an early age Dan learned the value of hard work and great customer service. While working at his family’s sporting goods store, his grandfather’s farm, and uncles gas station Dan learned the risks and rewards of owning and running a business. Dan started his political science degree at the University of North Dakota and finished his bachelor’s degree at North Dakota State University. He is proud to be a fan of both UND hockey and NDSU football. In 1993 Dan was lucky enough to marry Jennifer Krogen and made Fargo their home. Dan and Jennifer started their entrepreneurial career in 1994 opening an Italian quick service restaurant The Spaghetti Shop which later was renamed Pazzo’s Pasta and Pizza. Dan and Jennifer worked together to run the day to day operations for over 10 years. In 1995 Dan added 3 Subway restaurants to their portfolio. After running the 7 day a week operations for over a decade Dan and Jennifer decided a career change was in order to spend more time with their children Lauren and Dane. In 2005 Dan joined Property Resources Group as an independent commercial sales agent. At PRG Dan was able to fast track his commercial sales knowledge by participating in a large variety of commercial sales, leasing, construction and land development. In 2011 Dan started his own Commercial Brokerage firm Brokers Commercial Property. 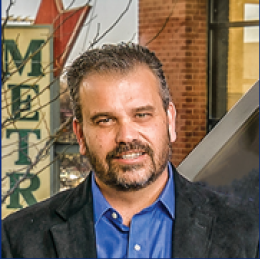 Dan has continued representing his clients in the sale and leasing of commercial property while starting a commercial land development called Prairie Grove Retail Center at 52nd Ave and 25th Street. Today Prairie Grove consists of Don’s Car Wash, Frank’s Lounge, Spicy Pie, Red River Coffee, Urban Edge Salon, Image Medi-Spa, 52 Fitness, Bright Futures Learning Center, and Burger King. A South Fargo residential land development opportunity lead to the formation of L2H Development with Steve Iverson in 2013. L2H is short for “Land to Home” and has been the developer for both Crofton Coves and Prairie Farms. Crofton Coves was the first development to offer coving in the City of Fargo. Crofton Coves lives up to the motto that it is “Distinctly Different by Design” by offering varying setbacks and meandering sidewalks to create the “coving” effect with the curvilinear designed streets. Prairie Farms is an exclusive 73 lot South Fargo development offering large lots, mature trees and parks. This exclusive 73 lot development has 59 lots without backyard neighbors, 13 lots with private alley access and 9 lots are more than 1 acre in size. When not at work you will find Dan enjoying time with his wife Jennifer, and children Lauren and Dane. Dan also enjoys motorcycle rides with his wife, hunting with friends, being active in Hope Lutheran Church and time spent with family and friends at Pelican Lake in the summer.